Fort Myers Beach is in Lee County, Florida and is located on Estero Island. At the time of the 2010 census, Fort Myers Beach had a population of 6,277 residents. Fort Myers Beach is in the Cape Coral-Fort Myers Metropolitan Area. Fort Myers Beach is one of the world's safest beaches and features pristine, white sugar sand, with gentle dunes, and sand bars. 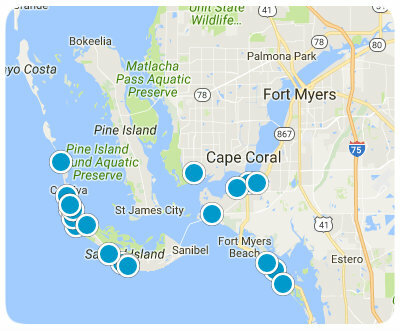 Fort Myers Beach has a total area of a little over 6 square miles with slightly more than 3 miles square miles of it being water. Fort Myers beaches in the 33931 zip code. Some of the finest homes and condos in southeast Florida can be found along to 7 mile stretch of sand along Fort Myers Beach. There's no better way to eliminate stress and tension then to spend the day on a beautiful beach of Fort Myers. Fort Myers offers some of the best beachcombing in the country as well as jet skiing, bird-watching, deep sea fishing, scuba diving, and even outlet mall shopping. Local attractions nearby include the Ostego Bay Marine Science Center which offers family fun and education as well as the Estero Bay Aquatic Preserve which allows visitors an up-close and personal view of the natural habitat of local ocean dwellers. There's no shortage of activities for the nature lover between dolphin watching, manatee spotting, collecting seashells, and local Eco tours. Fort Myers Beach events include the Fort Myers Beach Pirate Fest which features two stages filled with simultaneous acts, held in October. The annual American Sand Sculpting Championship and Beach Festival is held at Fort Myers in November. The month of December brings the Fort Myers Beach Christmas Boat Parade. Feel the weight of the world lift from your shoulders watching a beautiful sunset on the Gulf of Mexico. Fort Myers Beach offers all that's needed without the overwhelming crowd and hassle of much busier places such as Orlando and Miami. Condominiums, townhomes, single-family homes, and lots upon which to build your dream home are all types of real estate currently on the Fort Myers Beach real estate market. Condominiums are the most popular type of housing found on Fort Myers Beach. Many visitors come to Fort Myers to vacation and leave owning a condo! Both gulf and bayside options are available on Estero Island. Gulfside condos offer wonderful views of the Gulf of Mexico and provide stunning views of sunsets on the water. Prices for condos in Fort Myers Beach start around $174,900 and go up to $1,200,00 for exceptional properties. Fort Myers Beach single-family homes start at approximately $183,000 and can go as high as $4,195,000 for luxury beachfront front properties. The average listing price for a single-family home in Fort Myers Beach is $927,724, while the average listing price for a lot in Fort Myers Beach is about $467,929 with some amazing waterfront properties selling for as much as $1,800,000. Contact us today to answer any question or to schedule a tour of any or our outstanding Fort Myers Beach, Florida properties.